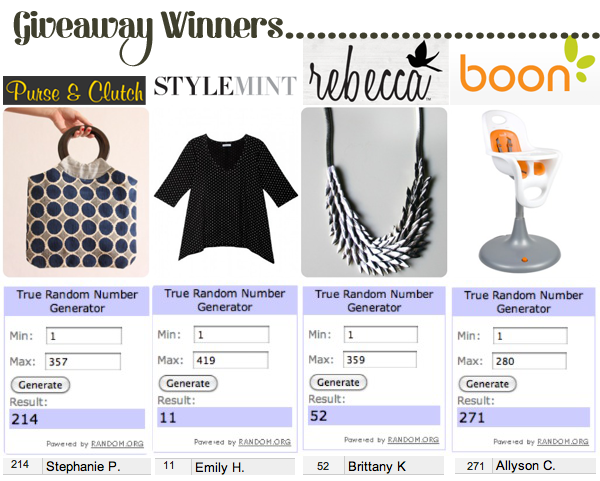 Purse & Clutch giveaway winner: Stephanie P. | StyleMint giveaway winner: Emily H. | Rebecca $45 giveaway winner: Brittany K. | Boon Inc. Flair Chair giveaway winner: Allyson C.
It was pretty much like the Oprah show over here, wasn't it? Congrats to all the winners and a huge thanks to Purse & Clutch, StyleMint, Rebecca, and Boon.